STRASBOURG,France - The United States is not developing space weapons and could notafford to do so even if it wanted to, an official with the Pentagon's NationalSecurity Space Office said Thursday. 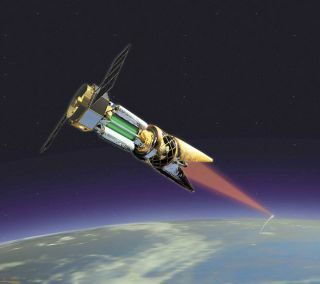 Pete Hays,a senior policy analyst at the space office who is also associate director ofthe Eisenhower Center for Space and Defense Studies, said U.S. policyon space weaponry has remained pretty much the same over the last 30 yearsdespite the occasionally heated debate on the subject during the administrationof former U.S. President George W. Bush. "Therehas not been one minute spent on this issue as far as I know," Hays saidof U.S. Defense Department policy on using weapons in space. "There are nospace weaponization programs. It's an issue that academics like to flog now andthen, but in terms of funded programs, there aren't any. I can tell you thatcategorically." Hays madehis remarks during a space security conference organized by the InternationalSpace University here. He said that even if the United States decided to embarkon a space-basedweapon system, it could not pay for it given its current military programcommitments. Hays saidthe U.S. policy of refusing to sign a treaty banning space-based weapons hasnot changed since the 1970s. Despite occasional efforts, no administration,Democrat or Republican, has been able to craft an acceptable treaty. Hays saidhe cannot explain why a policy statement from the new administration of PresidentBarack Obama appears to highlight a priority of seekinga worldwide ban on weapons that would interfere with satellites. "Thiswill be an extremely difficult policy to adopt" for the same reasons thatother administrations have fallen short, Hays said. "It is not for lack oftrying that the United States and others have been unable" to produce atreaty. Russia andChina continue to try to win support for such a treaty at the United NationsDisarmament Conference. In aseparate presentation to the conference, John Sheldon of the School of AdvancedAir and Space Studies at Maxwell Air Force Base, Ala., said defining spaceweapons will never be possible to the extent demanded by a treaty. "Fourguys in black pajamas who attack asatellite control station: That too is a space weapon, and you cannot stopit," Sheldon said.